Whether you're a frequent flyer looking for more miles, or just flirting with the idea of lifting a toe off your mat, this all levels workshop is designed for you! We'll begin with a flow specifically curated to warm up your core, shoulders, hips, and wrists, and then we'll dive into the foundations of flight. By breaking down the essential elements of Arm Balances, you'll learn tips and tricks to safely and successfully arrive in poses such as Bakasana (crow), Koundinyasana (Flying Splits), Side Crow, Flying Pigeon and more. Come ready to sweat, laugh (probably a lot), and learn. Women are having a moment! More than ever, we're showing up and demanding equality in all parts of life. We know knowledge is power, and this workshop aims to educate and empower you invest in yourself and claim your financial independence. Whether you think you need a spending plan, are just getting started with investing, or think your investments might need a re-boot, this workshop covers everything you need to know to be dangerous. If you aspire to financial freedom, are curious how best to leverage your money, or just want a safe place to ask any questions that are too taboo for the dinner table - this workshop is for you! Stephanie Xenos, badass barre instructor and founder of Money Muse, is a recovering rocket scientist and personal finance enthusiast. After an "out of this world" career at NASA and SpaceX working on space ships, rockets, and satellites, she reached her goal of financial independence and "retired" at 32! Stephanie recently launched Money Muse, a company that aims to empower women to achieve financial independence through events, coaching, and accountability. More info on Stephanie can be found at themoneymuse.co or her instagram @money__muse. Come early to mingle! Workshop starts promptly at 1:30pm. Celebrate our 4th birthday with art, music, and healing! +++ PLUS exclusive day-of discounts on Class Punches, the Dreamer Pass, and Teacher Training! The Craft of Teaching Yoga empowers trainees to lead a creative, musical, and meaningful vinyasa flow. We enroll practitioners to be an active participant on the mat, and in their lives, with expanded self-awareness, purpose, and presence. Through the felt experience of yoga philosophy, we increase our capacity to lead as yoga facilitators. We awaken, we flow, we expand, and we integrate. We emerge from this training transformed, yet closer to our selves than ever before. Are you an experienced yoga teacher ready for the next level of awareness of the subtle body in both the felt sense and your teaching? Do you want to ground your knowledge of the wisdom teachings with a sense of lineage and science? Are you an Acupuncturist who wants to learn to support patients with movement? This 25-hour immersion into the Energetic Body and Yin Yoga with Leah Adams and Dr. Eric Baumgartner supports students to metabolize and own the information through lectures, hands-on learning, and practice. We welcome anyone who has a sincere interest to explore yin yoga, existing yoga teachers and other wellness professionals (body workers, massage therapists, chiropractors, acupuncturists, osteopaths, physical therapists, etc.). If you are newer to yin yoga, contact us at yinyogatraining@gmail.com and let us help you prepare for the program. This training will empower teachers to offer practical tools that yoga teachers can apply to their own lives and to their yin and yang teaching. The time we will spend in class is an opportunity for teachers to become rooted in ancient practices. We will draw a connection between how to fuel sustainable, and healthy bodies, hearts, and minds through the energetic eastern lineage perspective. This yin yoga and energy body immersion will be a deep dive into understanding your own neurochemistry so you can actively participate in your wellbeing and vitality. This 25-hour program is designed to be an immersion into the experience of yin and the energy body through the Traditional Chinese Medicine map. The training is designed for yin yoga teachers, experienced yoga teachers, acupuncturists, massage therapists, and anyone else with a sincere interest in learning about yin yoga, meridians, and the energy body. We highly recommend individuals seeking to teach yin yoga study and enroll in 50+ hours of yin yoga focused teacher training. There are several excellent programs we would be happy to recommend to you. Please reach out if you are interested in learning more! Leah Adams — Leah is a certified Yoga Instructor and Ayurvedic Wellness Counselor. She describes yoga as a "natural and essential component" of her humanity, a practice that is “beautiful and effective because it taps us into our parasympathetic nervous systems and allows us to rest, reset, heal and digest to feel calm and nourished.” Leah has an extensive amount of training and education in both yoga and Ayurveda. Eric Baumgartner — Eric Baumgartner is a father and a pilgrim, and has spent the last 20 years in the study and practice of medicine traditions from around the world. His father and grandfather were both physicians, and though he grew up knowing he would be a doctor someday, he had no idea that his path would lead to Chinese medicine. He currently holds a Master's degree in Traditional Oriental Medicine from Emperor's College and practices functional medicine, acupuncture, herbalism, and nutrition in Ojai, and at Alchemy Spa and Wellness in Santa Barbara, California, where he served for the last 4 years as Clinical Wellness Director. Eric is currently a Doctoral Fellow in Acupuncture and Oriental Medicine with a specialty in Family Medicine at Pacific College in San Diego, with specialization in Women's Health, Pediatrics, Mental Health, Neurology, and Orthopedics. He studied Functional Medicine under the mentorship of Dr. Daniel Kalish of the Kalish Institute, and continues to study transpersonal psychology, alchemy, and comparative theology within the Pneuma System. In his spare time, by heritage and by grace, he is an organic tree gardener and wildcrafter, aspiring solar artist, kitchen alchemist, and backcountry naturalist, prone to sudden bouts of singing and absurd voice impersonations, usually to be found digging, writing, playing with his kids, adoring his wife, or concocting some nutritious if not always delicious potion, smoothie or salsa. Questions? Click here to email Leah and Dr. Eric. Join Adrienne & Eric for an embodied experience that merges ancient yoga traditions with somatic exploration, energetic anatomy, the timeless wisdom of nature, and nondual tantric philosophy. /// This workshop is open to anyone interested in applying the philosophy of yoga to their every day lives. All levels welcome. Our Body is a fluid body, both evolutionarily and embryologically. Made from fluid processes that specialize and create the unique architecture of what we become. To open into the fourth state or the transcendental state we can tune into the liquid sensibility of our body/mind in order to slip into the transmutability available from the potential space that lives there. Classes will include lecture, asana, free movement and meditation. >>> Friday: Inner and Outer Ocean. A calm, grounding liquid flow tapping into the sensation of the fluid inner ocean; and it’s relationship to the viscosity of the fluid outer space. In the mental space of presence and permeability we will work with the meeting of these two oceans, culminating in the boundary we call our skin. This class and all classes will involve a combination of asana, meditation, free movement. Class intensity will be presented in a structure tailored to the mind of the room. ///// Saturday morning: Bone Spirals. The density of our bones can mislead the truth of their liquid past, and their organ like liquid intercommunication. In this class we will use asana and free movement to follow the spiralic constructs of the body. We will play with the magnetism and bouyance of joint space to both enhance help unlock forgotten pathways. A vortex in water creates a magnetic pull that organizes all the liquid structures around it into a synchronized.... Spiral. In our human body there are inherent drags... pulls that orchestrate the sensitive orchestra of our remarkable instrument. In this class we will play with several of these energetic pathways and combine them into flow sequences designed around planes of motion. The liquid chi can run on many channels of our body – but the weft and weave of our “neural Net” can be found perhaps most tangibly in the fascial streams. Here we will use the fascial lines to find our way into flow, as we trace the spirals and inner rivers into a full electrical network of chi to ride into flow, using asana and free movement. ... pssst! because this lecture is included in The Craft of Teaching Yoga, there is very little space. Book your spot asap! All payments are nonrefundable. The MiNDFUL EATING METHOD developed by Dr. Sharon Suh helps you make peace with your relationship to food. Eat with joy and without guilt. Learn to truly love and appreciate your body. In this 8-week course, we learn how to identify and address the different kinds of hungers we all have and how to care for the self with compassion through mindful eating. We also learn foundational mindfulness practices to develop awareness of our experiences without judgment and learn to take better care of yourself by learning to trust our own intuitive sense of hunger and what we truly want to eat. We learn to listen to our own body cues and signals for what we wish to eat and we learn to give ourselves what we really want—no one else gets to tell us what we need. That’s up to us! >>> 10% off for Dreamer Pass holders! Sharon A. Suh, Ph.D. has completed the Mindful Eating-Conscious Living™ Level 1 Training with Jan Chozen Bays, MD and Char Wilkins, MSW. She completed her 200-hour RYT certification, Yoga for Trauma (Y4T) certification, and completed the Trauma Informed Yoga Teacher Training through Yoga Behind Bars. She is a professor of Buddhism at Seattle University and serves on the board of directors of Yoga Behind Bars. The Journey Card is an epic Bohemian adventure! This journey challenges you to visit every instructor, and class offering, we host at Bohemian Studios, in Phinney Ridge and West Seattle. Like any good adventure, it is challenging, but we learn to love the complexities of all the twists and turns. It’s about the Journey, not the destination, and every bit is worth the trek! While the payoff (free stuff!) may allure you to keep going, you’ll soon realize that the Journey itself is rich and rewarding. You’ll engage with our community, and you will build bonds with our instructors and other Dreamers. Through the Journey you will explore new times, teachers, and offerings, too. Nada. Journey Cards are free for everyone while supplies last! Attend class and get your instructor’s signature. All scheduled teachers are included on the card, but subs are not. Fill the entire card with your instructors' signatures. Stay on top of getting your signatures! You cannot obtain signatures retroactively, so if you forget your card for a class, you will be unable to get a signature for that class. The Journey Card must complete on or before April 1, 2019, and posted to your social media to claim prizes. BTW, there are lots of little giveaways along the way, keep reading for details! Frankly, we hope your Boho journey never ends. But for this challenge, please take a picture of your completed Journey Card and post it to Instagram or Facebook to claim your prize! Remember to hashtag #bohojourney and @bohemianstudios. You can turn it in sooner, but not later than April 1! How do I claim my prize? THIS IS IMPORTANT! Take a photo of your completed Journey Card and post it on Instagram using the hashtag #bohojourney by April 1! Err, but what about the extra giveaways you talked about??! Each week, we’ll offer prompts: 1. spirit 2. love 3. growth 4. creativity 5. freedom 6. struggle 7. resolve 8. community. all posts IN by Sunday at 9am - weekly winners announced on Sundays! pssst! posts must be current hashtag can’t be applied to old posts. Journey Cards hit the studio in mid-December so get yours asap! Friends, it's time to indulge in the ultimate gift: 2 hours of self-care! Grab a buddy or just your fabulous self and c'mon over to check out the beautiful new West Seattle studio space. Your Bohemians do it again! The artisans of your beloved Bohemian Studios gather to bring you the Bohemian Marketplace. After our Ritual, all are invited to stay to digest the class together and explore the art of authentic theming. Are you in absolute wonder with yoga? Do you wonder why this ancient tradition has survived millennia, more or less intact? Where did yoga poses originate, and how has it evolved into modern-day athletics? You ready for a deep dive into the inner landscape of your spiritual self? Join us for a *free* info session on The Craft of Teaching Yoga after Adrienne’s Spirit Flow. Your yoga class is *free* if you stay for the info session! With the holiday season approaching faster than anyone is comfortable with, now is the perfect time to explore ways to stay present with yourself when difficulties arise by developing your own personal toolbox of wellness practices to care for the mind, body, and spirit. Welcome, to the world of self-care! Whether you hold space for people at your job or at home, it can be exhausting to be the caretaker, listener, conflict manager, or problem solver. As you work and engage with co-workers, clients, children, and loved ones - how do you remain balanced and honest with yourself so you can meet others with clarity, authenticity, and purpose? We know that to be of service, the journey begins within, but what practices do we turn to maintain this sense of balance? In this workshop, we will recall simple yet powerful methods of self-care – yoga, meditation, Yoga Tune Up® self-massage, breath practices, spiritual practices and more! – that allows us to reconnect to ourselves so that we can show up to our lives with integrity. *This option is meant for people who want to borrow studio YTU balls or who already own their own YTU balls. Normally therapy balls are sold at their full price of $15. Autumn is an optimal time for slow and grounding practices, such as yin yoga, to help us connect with stillness and reflection. Yin facilitates a healing cycle of receiving and releasing which can support us in aligning with the cycles of nature. In our extended yin practice, we will apply static, gentle pressure in long holds to build fluidity and elasticity throughout your connective tissues. This workshop is focused on yin yoga poses for the upper body which will facilitate openness in the chest, release in the neck and shoulders, and softening tension jaw. The yin practice promotes strength and the mobility of Qi (vital energy) flow throughout the meridian systems we will be specifically targeting enhancing and balancing lung Qi. Throughout the practice, we will draw on ancient breathing techniques to focus the mind and release patterns of tension. Developing a conscious relationship to your breath can shift us in body, mind, and spirit. Have you ever noticed how you take a deep breath right before you do something challenging? We intuitively know that we can use the breath as fuel to ground us for life’s most challenging circumstances. Out of all of the processes of the autonomic function of the nervous system, the breath is the only one we can control. We take in on average 21,000 breaths every day. In many ways the breath functions like a river, it will flow whether we watch it or not. Through skillfully practicing ancient breathing techniques we can unblock our vital life energy, soothe the nervous system and invite in a sense of deep relaxation. This program is designed for experienced instructors eager to teach at Barre Bohemian! If you have taught barre, dance, or power yoga for more than 2 years—and you are currently teaching—you may qualify for our Barre Bohemian bridge program. Your training is at a reduced rate of $1,095 for the entire program. Must be currently teaching at least two classes and demonstrate teaching experience in order to apply. After our Ritual, yoga instructors are invited to stay to discuss intelligent sequencing for peak postures. Join Carly Glenn for an all-levels fitness assessment and cardio circuit challenge! 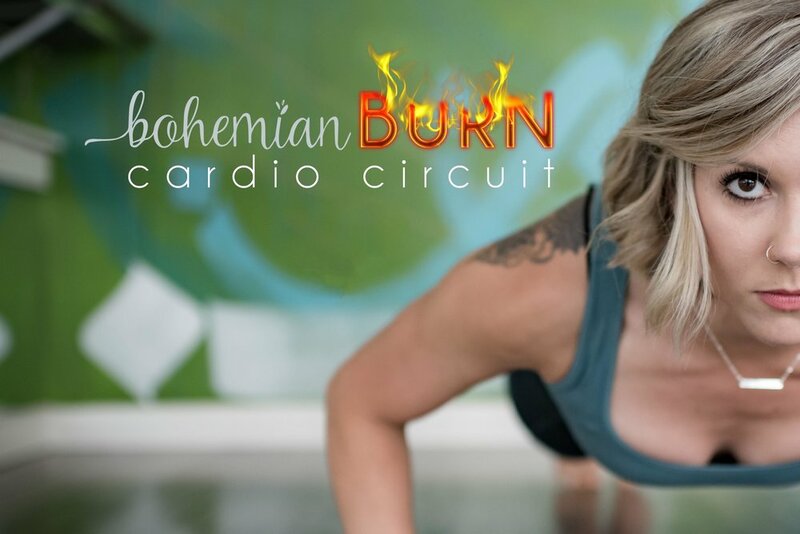 Begin by finding a baseline of your fitness with bodyweight strength and conditioning exercises, as well as calculating your Lean Body Mass (LBM), and follow it up with a super fun, energetic cardio circuit workout. Carly is a dynamic and knowledgeable instructor with experience in barre, yoga, pilates, HIIT, and personal training, and she’s ready to take you to the next level. Exercises like barre, yoga, and other forms of strength training increase your LBM, which results in benefits like higher energy, increased metabolism, improved immune system, stronger bones, and so much more! We will track your fitness results and LBM, and provide you tools to watch your progress grow. Bring a yoga mat (or borrow one of ours), clothes to move in, and be ready to sweat! Barefeet or grip socks if you prefer. All levels welcome and encouraged! Questions? Reach out to Carly! The Craft of Teaching Yoga presents Live Anatomy // the hips, the second of three anatomy sessions. The hips are c o m p l e x and oh so wonderful. Magically, our hips connect our upper body to our lower body, and through this we are able to walk, run, jump, squat, hop, dance, kick, and balance. Our hips consist of dozens of deep muscles, one strong superficial muscle (the booty), hip halves that move independent from one another (say, what? ), a tail bone (that's right, we have a tail! ), and a sacrum which is a fusion of five vertebrae. Get in on this interactive 3-hour workshop where we will explore the ins and outs of the anatomy of your hips and how to move, stretch, and engage your hips healthily in yoga asana. Adrienne and Eric not only help you understand your hips completely, but will give you tools that will help you embody the specific movements of your hips. The Craft of Teaching Yoga presents Chakras Illuminated // inner work for potent expression. Join master instructor Adrienne Kimberley for a profound exploration of your energetic anatomy—the Chakras. Yogic chakra philosophy is a self-study lens that illuminates how to live our lives with rich and vibrant self expression. Utilizing thought, emotion, discussion, and movement, we have the power to heal and release our conscious and subconscious energetic blockages. Yoga instructors will especially enjoy this experiential lecture, as each chakra has physical postures and themes that inspire potent topics for all yoga practitioners. Claudette is passionate about the experience of higher strength, sensitivity, freedom, skillfulness, and wisdom so that yogis can cultivate greater connection in their lives. In Claudette's Sanskrit workshop we learn how to honor the ancient teachings and utilize our voice to improve the clarity of focus and foster the power of sound. The Craft of Teaching Yoga presents Living Yoga Traditions. This Dynamic workshop teaches Traditional Vedic 8-Limbed Yoga as a combination of invigorating physical and technical Ashtanga Yoga Asana bathed in philosophy. As a long time student of Vedanta, Sanskrit, and Asana, Jenna learned the 8 Limbed path via Vedic Teachings through Swami Tattvavidananda on the Yoga Sutras. She will approach Ashtanga Primary Series through the lens of the Yoga Sutras, leaving students with a compelling window into what Ashtanga can do for the body-mind when practiced in a traditional form. When we understand HOW YOGA WORKS - it immediately works to our advantage - reaching deeply into the subtle body and creating a reliable source of vitality for the student. We explore postures with an awareness of breath, alignment and “Traditional Inner Methods” creating the conditions that will shift your yogic viewpoint & practice for years to come. Come learn how to apply ancient wisdom to your urban lifestyle! Yoga nidra is a guided meditation that induces full-body relaxation and a deep meditative state of consciousness. If nidra is a new style of yoga for you, this is a perfect introduction to the practice. After reflection and empowerment, you will settle into your savasana with nourishing stillness. Bring pillows, blankets, eye pillows, slippers or other warm & comforting items to support your rest. Questions? Click here to reach out to Maria! Join our method creator Adrienne Kimberley for a special edition Barre Bohemian Master Class: Bands & Buns. This 75 minute total body burner lights up your inner badass with rhythm and soul. You'll leave feeling empowered, renewed, and so alive! Each Master Class introduces new exercises to the Barre Bohemian repertoire and educates you on functional anatomy and crucial alignment tips to keep your body healthy in every class. All are welcome—students and teachers alike!